The economics of hospital inpatient palliative care is a subject of significant policy interest internationally. Older people, and particularly those with multiple serious chronic conditions, account disproportionately for hospital admissions (McCusker et al. 2003), and up to half of recorded deaths worldwide occur in hospital (Bekelman et al. 2016; Broad et al. 2013). Hospitalization costs represent the main component of end-of-life costs across healthcare settings (Simoens et al. 2010a). Economic studies of palliative care for adult hospital inpatients suggest that persons who receive palliative care have lower costs and earlier discharge than matched patients who receive usual care only, as well as improved outcomes. 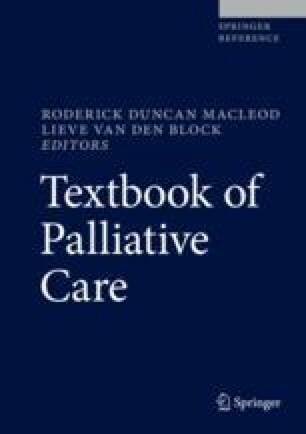 Additionally, palliative care’s effect is larger when provided earlier (raising questions of when palliative care should be introduced in the trajectory of illness for people both inside and outside the hospital) and is also larger for adults with higher numbers of comorbidities (suggesting that complex interdisciplinary interventions are more effective for complex clinical cases, an insight with major potential policy relevance worldwide). Further economic evaluations of palliative care beyond the hospital silo to evaluate impacts across whole trajectories of care are needed. Only then will policymakers have the full story on the costs and benefits of complex care for those with complex illness.